IntelCrawler, a security company, found thousands of terminals that send data to satellites that may be vulnerable to hackers. Land-based terminals that send data to satellites may pose a soft target for hackers, an analysis from a computer security firm shows. VSATs, an abbreviation for "very small aperture terminals," supply Internet access to remote locations, enabling companies to transmit data from an isolated network to an organization's main one. The devices are used in a variety of industries, including energy, financial services and defense. VSATs face the Internet just like any other server, and the terminals have IP address ranges that can be scanned. 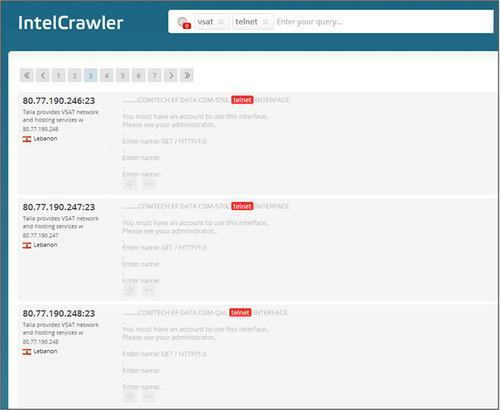 That's what Los Angeles-based security firm IntelCrawler did to get a feel if the terminals were vulnerable to attack. Their scan, conducted about three months ago, was benign and the equivalent of walking down a street and knocking on a few doors to see who answers. Depending on the response from the VSAT, cyber investigators can, within legal bounds, get an idea of what attacks could open the device up to spying. "The door might be six inches open, and of course you're not going go in, but you can see there's a vulnerability there," said Dan Clements, IntelCrawler's president. The company specializes in studying the source of cyberattacks. It found near 3 million VSATs, mostly in the U.S., of which more than 10,000 were "open," either using default passwords or had open ports, according to a writeup on IntelCrawler's blog. "There's a lot of information that could be used in a nefarious way," Clements said. "Certainly you could put together a plan to go after certain grids or dams or power plants and have access to the centralized network at some point." One of the largest manufacturers of VSAT is Hughes, a division of EchoStar of Englewood, Colorado, which specializes in satellite and video-delivery services. IntelCrawler found 9,045 open Hughes VSATs. VSATs from Hughes are used in offsite ATMs, several national central banks, nine out of 10 of Brazil's largest banks and on 90,000 financial sites in countries from Azerbaijan to Zimbabwe, according to a 2012 report from Comsys, a satellite industry consultancy. IntelCrawler found 313 open UHP VSAT terminals, made by Romantis Satellite Communications of Berlin, and 1,142 VSATs from SatLink, which is owned by Emerging Market Communications.